The Human Moxie | Genuine people share their story of courage with the hope of inspiring others. Deadlines. Who likes them? They invoke stress. You start to sweat. Your thoughts are disorganized at first, but nevertheless, deadlines force you to produce. I was challenged to give myself an hour to write. Just write. I tend to overthink my words and thoughts. Mostly because I am a perfectionist who procrastinates with ADHD. I self-diagnosed myself, but I decided to bite the bullet and write something down in sixty minutes. Here it goes. I have learned about in the past, and was enlightened again this morning, that I have reacted to many situations in my life. Those reactions lead to further reactions that continued a downward spiral. This isn’t really a secret, but at the same time, many people may not know this about me. After a failed long distance relationship in my early 20s, I reacted to that disappointment by entering into a new relationship very quickly. The failure of the relationship had happened long before I entered into this new connection, but my heart still held on to the hope of a romantic rekindling for two years. That hope was finally stifled when I received word that that man in my heart was engaged to be married in August. I can’t tell you how RELIEVED I was. I went through the stages of grief within 24 hours. And that was that. David Cantu didn’t know it at the time, but as co-workers, it was easy to notice his compassion and concern for people he had in his care. His mannerisms, how he intently listened to his patients, and as supervisor of the department, he was definitely a leader that I looked up to. I am an emotional person. If we all really think about it, we all are. We react to life more than we think we do. This leader was giving me attention – attention I hadn’t been receiving from my ex and that I craved. I felt important and appreciated. And wanted. It didn’t take long for things to escalate and over a lonely Memorial weekend, miles apart as David was with his dying father in a Lubbock, Texas hospital, I called him with news that I was pregnant. My reaction was FEAR and DEVASTATION. Fear of what other people would think and say about me. Their judgment of me or my parents. What my parents would do. Devastated that I wouldn’t have the wedding I dreamed of. Devastated that I wasn’t even confident of my love for this man. Devastated that he might not be the one. I just loved the thought of love. These emotions then led to the unthinkable. The mother of reactions at this point of time. I knew I had to hide it and abortion was MY answer. Reactions create a snowball effect. Had I had a different perspective on that futile long distance relationship, I am confident that the course of my life would have been very different. But I didn’t. If you are reading this, I don’t know what your belief system is, if you think there is a higher power or not, but from a young age, I knew God was real. I also learned, for myself, how MERCIFUL He is. The day I decided to go to a Planned Parenthood branch, they were closed. CLOSED. On a MONDAY! I left that empty parking lot that day and just prayed for God to help us get out of this hole. I didn’t take prenatal vitamins hoping that I would miscarry. I didn’t take care of my body period. Days turned into weeks. My sister was married in June and David proposed the weekend after her wedding. The abortion hadn’t taken place yet and I still hadn’t miscarried. A series of events led to my family discovering the news. As difficult as that was, it was a RELIEF. I was forced to own my zone. To no longer be in a state of reaction, but creation. I had to create trust. With my parents. My family. My pastors. And trust God with my future with David. It required owning my zone. It was the hardest thing I have had to do in my life. Instead of reacting to my circumstances and let life determine my choices, I had to own my decisions and stay in my lane. My lane meant carrying our baby to full term. I have seen many times in my life where one’s success would stir jealousy in me, or coping with life stresses meant unhealthy eating and lifestyle habits. I was reacting. In a state of reaction is where the enemy wants to keep you. He steals your ability to create and be a dominion over the talents and gifts that God has given YOU, specifically, and instead kills and destroys your desires and your dreams because you are reacting to the fear of what others will think of you, or reacting to what they are doing better than you. Our marriage has not been bad, but it’s not been perfect either. However, we knew last year that we needed to stop reacting to life and to each other. We started to own our lane, our own marriage, the gift God has given to us – each other. And we are in dominion mode of our marriage, bettering it by reading God’s word, surrounding ourselves with friends and mentors who are successful in their own marriages. We are surrounding ourselves with likeminded individuals who are successful in their communities, in their businesses. It’s made a world of a difference. It’s not perfect, but we are owning our lane. We aren’t leaving it up to reactions to steer the course of our destiny. With God’s help, we are being purposeful with our health, our marriage, our children, our finances. Our good friend, Josiah, hit the nail on the head last weekend when he said, “Yesterday’s ceiling becomes today’s floor.” That’s what we have discovered and why we have grown in just the past year alone – because we have stepped into this process. The reactive way is the easy way. The creative way is the hard way. And we do the HARD THINGS. arlier this year, my husband had agreed to do a full-time assignment for seven weeks in addition to his permanent full-time job. During that time, I was so overwhelmed by my three children that I was sure I was experiencing emotions I thought any single parent would. And I thought to myself not only then, but many times in the past: how does a single mother (or father) do it? How does one provide for their children, care for them and all of their needs (physically, mentally, emotionally, and spiritually), and still manage to stay balanced? It was the last time I would secretly ponder these questions before I contacted Melanie who graciously introduced me to her previous life of single parenting. A beautiful red-head and just eighteen years old, Melanie married the kind of man most teenagers her age dreamt of marrying – the kind that smitten girls would describe as the tall, dark, and handsome type. Gradually, the couple had three children and a successful business operated by Melanie in their million-dollar home. On the outside, they appeared to be the quintessential picture perfect family. But after enduring over nine years of pain, the verge of collapse abruptly came to a head. On an ordinary April afternoon, Melanie’s estranged husband took his belongings and left her behind with their three children, setting into motion a bitter process toward divorce. Needless to say, Melanie was overcome by a myriad of fears and worries. Finding a new home and earning an income to pay the bills while raising and supporting her young children was downright overwhelming. But that was just the beginning. Melanie was afraid of the repercussions she felt her ex-husband was capable of or might inflict upon her person and her reputation. She dreaded humiliating her parents knowing how much her sister’s divorce almost a decade before had devastated them. She feared being despised by the church she had grown up in and belonged to for over twenty years. And she worried that she would be rejected by her friends and her children treated as outcasts. At only twenty eight years old, Melanie officially had sole custody of the couples’ children (ages 7, 5, and 2), tarnished credit due to her ex-husband’s poor financial decisions, and a profitable business she was forced to gradually shut down. Melanie desperately searched for spiritual guidance to help navigate her young family through the uncertainties of their fragile situation. Adjusting to her new role as a single mother was extremely difficult. Stress was at an all-time high in the beginning. Tardiness and speeding tickets became the norm for a time. Car collisions were miraculously avoided as she tended to her fighting children in the backseat. That first summer on her own, Melanie realized few outdoor activities were as appealing as they were low maintenance, so she planned park excursions with her kids and enjoyed picnics together. Sometimes, she took her children on walks or visited their grandparents. But for every good moment Melanie had, she had several moments where she was tired, sad, and lonely. 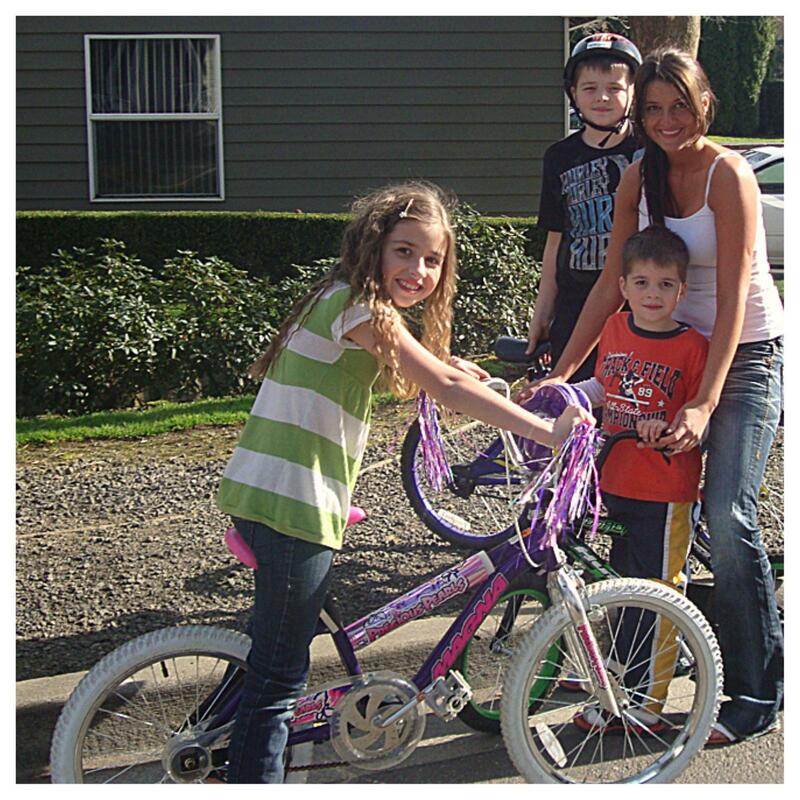 The family pictured together on the day Melanie taught her youngest, Timothy (5), to ride his bike without training wheels. As she might have expected, Melanie did lose some friendships, but she was determined to protect her children from the typical stereotypes placed on broken families. 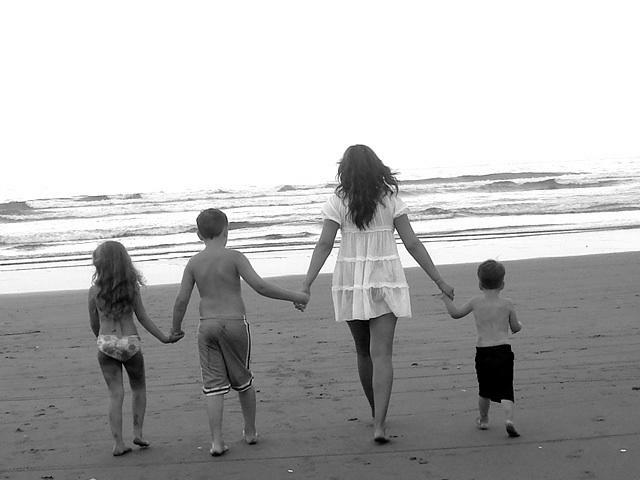 Melanie made a conscious decision to intentionally focus on her children and their well-being. Throughout the ordeal, she continued attending her home church but with some feedback from her children, kept an open mind and explored other area churches also. Her immediate family was her main source of moral support. Melanie’s eldest sister reminded her of an exemplary woman, wife, and mother – the woman described in Proverbs 31. “I posted the passage on my refrigerator and memorized it. I thought this was a very wise and business savvy woman. God was with this woman and if He was with her, then God would be with me too,” says Melanie. Faith, Timothy, Melanie, and Anthony meet her parents and sister for lunch on a Sunday afternoon. “I didn’t know God the way I knew Him when I went through my divorce. I fell in such a deep love with this Jesus and I wanted Him in every aspect of my life. He brought the right books for me to read, the right music to encourage me. I was so hungry that I would download podcasts of sermons and listen to them after I put Timothy [Melanie’s youngest child] down for a nap. I would drink my coffee while I listened to the Word and absorbed everything like a sponge. She had just six short months to make some critical decisions before her ex-husband permitted their home to go into foreclosure. Finally, just before the house was taken away by the bank, Melanie found a residential home for lease. It was the only option she had at the time and was convinced she was destined to move her family there. The family packed their possessions and moved into the rental where she was permitted to launch an elderly care home for the second time. Her vacancies quickly filled and her business grew – a feat she credits to her heavenly Provider. “Hauling and loading groceries for the business and the kids in the pouring rain, alone, was very overwhelming sometimes. There would be times when I would just sit in the car and rest my head on the steering wheel and I’d pray, ‘God, I don’t have anymore strength. Please, help me!’” On numerous occasions, Melanie locked herself in the bathroom and wept in desperation believing that life with three small children was not meant to be lived alone. Not only was she terribly needed by her children, but she was the primary caregiver of five elderly clients. Melanie’s business was running steady, but a year later, the owners asked her to consider purchasing the home or relocate. Because the home was priced beyond her budget, she found herself standing at the crossroads again. Instead, she sold the business to the owners and once more, the Lord was her guide. He led her to a home that was not her preferred choice, a fixer-upper, but it didn’t require a down payment. Only at the insistence of her parents, Melanie warily agreed to proceed with the deal. More and more, Melanie realized how gracious the Lord was with her, not because of what she did, but because of Who He is. She started her business a third time, her expertise and savvy skills more refined than years past, and her earnings surpassed those of the days when she lived in her grand manor with her ex-husband. The increased revenue enabled her to refurbish the home while providing the best care for her family and her elderly residents. By this time, Melanie had a revelation that changed her mind about the God she thought she knew. At times, comfort for Melanie came in the form of passages from Scripture (Isaiah 54:4-17, specifically) or from pages in books written by inspirational authors like C.S. Lewis. Other times, lyrics from a worship song struck a chord in her heart. But perhaps the most influential instruments the Lord used to encourage Melanie were people. Melanie met ladies at her children’s school that held regular prayer meetings and spoke words of truth into her life. She hired a humble and courteous couple to help her with her business, but quickly became like guardian angels over her curious children. A thoughtful friend drew close to her during her hardship and occasionally invited her to lunch or offered to take the young family boating. Still, others stepped in with random acts of kindness and provided charitable gifts, like bicycles. 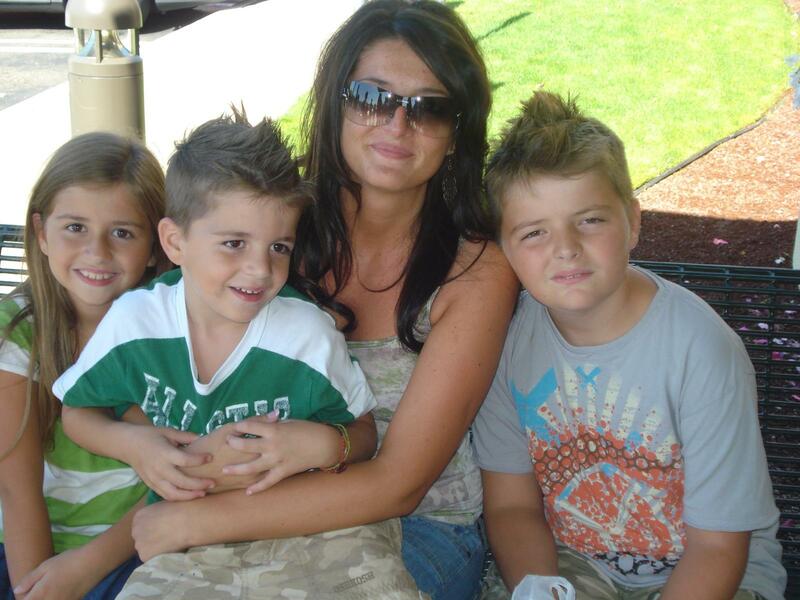 Outnumbered by her children and limited by her business at home, trusted friends helped Melanie by taking the kids on spontaneous trips to the Lego store and other little outings that her children looked forward to visiting. “God pulled away some people and brought near some people. As I went through those four years, He brought in individuals at just the right season – the perfect counsel and the perfect help. They are the kind you just can’t find on your own; they were the hands and feet of Jesus. I can’t overstate how much God used them to touch my life.” Then finally, one individual in particular entered Melanie’s mending world, forever changing the seasons and dynamics of her maturing little family. SO many! My favorite childhood memory was going to Disneyland with my family every year. We’d all pack up into the Ford Aerostar and it was just such a good time. And my dad always said, “Kids – don’t fight because…?” Then we all had to say, “Because it’s vacation time!” Just sitting in the car laughing with my parents on our way to Disneyland was so much fun. My parents really liked to travel and if we weren’t going to Disneyland, we were always going somewhere else. 2. a) Describe your best friend. My best friend, Carrie, is so fun, so fun to be around. So generous. She’s kind-hearted. So loyal. We’ve had each other since the second grade, so we have a really deep connection because I’ve known her for so long. We also share the same faith so that really helps you become really good friends with someone. I love that she’s supportive… I mean, how many hours do I have? I could talk about her all day! I actually just got back from visiting her in Las Vegas. She moved there after high school and she stayed in Vegas. She’s smart. She knows what she likes and what she doesn’t like. She’s family oriented. She’s eager to learn and eager to have fun. Eager to be a good person. I just love her! b) Did Carrie compete in pageants with you? Carrie never participated in pageants, but she did do modeling and acting. Same industry, just different areas. 3. What do you see when you look in the mirror? I see a lot of my parents. I see a lot of what they’ve done for me in myself. When I look in the mirror, I see my father. I see someone who is a hard worker, motivated, driven – who doesn’t settle for mediocrity. And then again, when I look in the mirror, I see my mom as well and I see someone who is passionate, who is loving, and who wants to see the best in herself. 4. What does true beauty look like to you? I guess you could describe it in so many ways. Beauty to me is having a version of yourself in your mind and living up to that standard you have for yourself. Beauty in others is so subjective because beauty is so different for everyone. I feel beautiful when I take care of my body. I feel beautiful when I’m in a spiritually good walk in my life. I feel beautiful when I do my make-up. I love that. It’s like an art to me. I feel beautiful without make up too, but what I mean is I feel beautiful when I can use my body as an art where I can dress myself nicely, do my hair, and be aesthetically pleasing to myself and hopefully to others. 5. 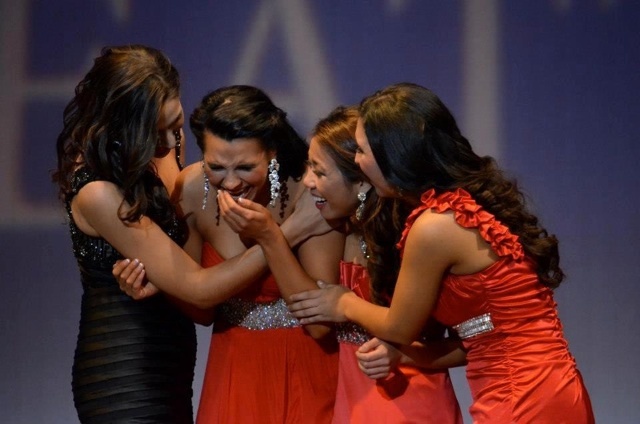 How did your family respond to your decision to compete in pageants? They have been supportive through all of it. It helped that I told my parents my intentions with it. When it was a hobby, I let them know it was just a hobby and it was just something I wanted to try. Then it became something serious when I started competing in the Miss America organization and I just let them know that my heart was there and I really wanted this. 6. How did you prepare before each pageant? I prepared a lot more for Miss Seattle the second year I competed. I should have prepared more for the first one. So you prepare different depending on how important it is to win. 7. Who came to support you when you competed for the Miss Seattle 2013 title? My parents were in Romania. But my sister Gina (who was pregnant at the time) was there. Lia – my oldest sister, my brother, my best friend who flew out from Las Vegas came to see me, and a couple more friends. About 12-13 people in all… Oh! My sister Roxy couldn’t be there. She was working in Texas and couldn’t get off from work. But my other sisters were keeping her posted throughout the competition. 8. What were some of your thoughts about winning Miss Seattle? Deep down I knew that for Miss Seattle 2013, I believed I put more work into that than any of the other contestants. And all of the other contestants are FANTASTIC, AMAZING women. My good friends come from pageants so I’ve had a lot of friends that I’ve competed with, but I had invested so much that there was no way someone would be more prepared than I was. 9. When you were crowned Miss Seattle, did you give an acceptance speech? Our program didn’t do that, but after the pageant, everyone (judges, contestant, families, etc.) went to Applebee’s for a reception because Applebee’s sponsored a portion of the profits made that day to the Miss Seattle program. That was great! I did a farewell video though before I gave away my crown to the next Miss Seattle 2014. The people that I thanked were the Miss Seattle Board (I had a board that helped me out); my director Cheryl; I thanked my mentor, Tamara; I thanked my two best friends, Kendra and Carrie; and then I thanked every one of my siblings individually; my parents; and all of the volunteers and people who helped out in the Miss America organization. 10. 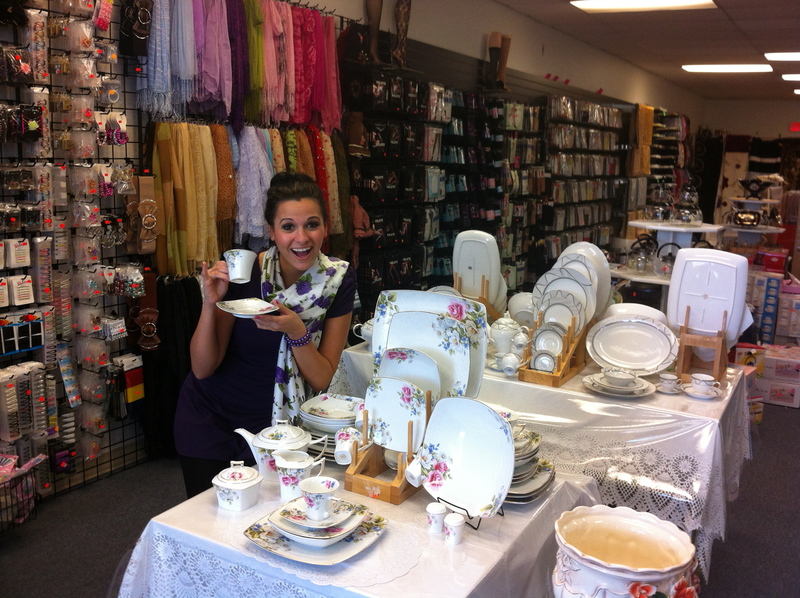 What kinds of fun things did Miss Seattle 2013 do in her community? I judged the Bite of Seattle… Going to Pike’s Place Market dressed up and catching the fish was really exciting. I can’t believe I caught the fish! I did so many things through such a long period of time that I kind of forget, but I enjoyed all of it. 11. Did you hesitate cultivating new friendships as a result of your title? I never did. Though I was Miss Seattle, I was always Delia. The friendships formed through pageantry are all positive. I don’t believe that I’ve lost any friends by competing in pageants either because this really fits my personality. I really am eccentric and I love fashion. I love performing. I love being in front of people. I love communicating, talking, and expressing myself through pageantry. I just met like-minded people. I met women who were motivated. I met women who believe that their education is important to them. I met women who were really motivated and wanted to succeed in their life. So only positive friendships occurred through this. 12. How do you stay healthy? I do an 80/20 kind of diet. I eat well 80% of the time and have fun 20% of the time. When I’m in pageant mode, I will go to 100% and it’s exhausting! But again, I like the challenge. I live with my brother but I do a lot of the cooking myself. I kind of learned how to cook because prior to 2012, I did not know what eating meant. I thought macaroni and cheese was a healthy meal! But I learned how to cook and what to cook and then once I won Miss Seattle, I went to a program call Onvo. Onvo sponsored me and so they let me go to a six-week seminar. Every Monday, we would go for about two hours and Dr. Mark Adams, the creator of Onvo, just taught us how to eat food. The exposure to that program, I think, was one of my favorite things about winning Miss Seattle. And it’s not a weight loss program. It’s not that at all. It was literally a doctor telling us from a doctor’s perspective what real food is and what’s not and teaching us how to read labels. It opened our eyes to the chemicals that go into our food and how manipulated our food system is in the United States. 13. When was the last time you failed and how did you handle it? I believe that I fail myself daily because I always think I could’ve done more. I could have been better. I could’ve worked out harder. And I believe I overcome that with my faith knowing that the Lord has a plan for me and I know that’s true because I’ve seen it play out. Having faith helps me overcome. 14. What is the most difficult question you’ve answered while competing in a pageant? I remember a lot of questions and it took me a long time to finally get comfortable with on-stage questions because you’re on the spot. A lot of time, I answered very poorly, but the most difficult question I’ve ever received was at Miss Seattle the year I won. The question was ‘If I were to talk to President Obama about one issue in the United States, what would it be?’ That was the hardest question. When I’m standing on stage, I don’t have any idea what the judges will ask. They can ask you about anything in the world and you have to be ready for it. My response was something like this: I believe that drinking and driving is a huge issue in the United States. I think that by saying the limit for blood alcohol content is 0.08 percent, it’s like saying that it’s ok to drink just a little bit and then get inside a vehicle. I believe that there needs to be a zero tolerance for drinking and driving. My grandfather was killed by a drunk driver just two years after he came to America and I saw the impact that it had on my uncle who was only six years old. I saw the impact that it had on him, my mother, and their siblings because they grew up without a father. I would have a zero tolerance for drinking and driving. I choose to speak out of conviction about something that really hits home for me and I believe that that’s the best way you can answer these questions. A lot of times in the past, I would just try to give the audience what they wanted to hear. But then I finally realized that it’s not about giving them what they want to hear. It’s about speaking from the heart and letting your emotions address the question. 15. 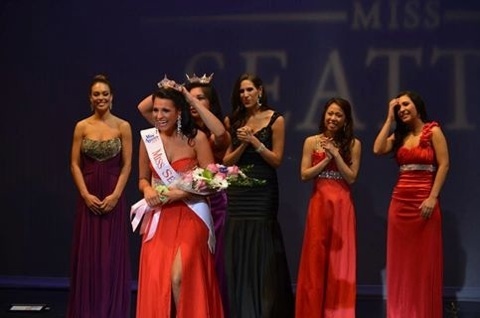 What emotions did you experience when you crowned the new Miss Seattle for 2014? Since I had a shorter reign – I had an 8mo. reign rather than a 12mo. reign – I did have sad feelings because I love to go to events and I love to do things so I felt like I would kind of miss out on a couple opportunities. However, the contestant that I crowned was a friend of mine and I really like her. I knew that my time was up. I knew that it was time to say goodbye to this and move on to something else. I was proud of her and I was excited for what she was going to experience because only very few women experience what she would experience in the next year. It was bittersweet in that I wish my reign lasted longer, but it was sweet in that I had so many memories. During the farewell, the Miss Seattle Board, the producer, Cassie, and my director, Cheryl, really made me feel special as I left. (Note: You can view Delia’s farewell video HERE). They really made the show all about me. It was so exciting. They let me perform (I performed twice) and then I came out in the opening number and I also co-emceed the show. So I thought, Oh yeah! This is awesome! I guess I just felt really loved as I was preparing to leave and I felt really appreciated. I felt like they were proud of the year that I had and it was so rewarding to feel – that others see you in such a way that you help the organization or that you did a good job. They were just proud and I really enjoyed that feeling. I was ready to go. I also knew that it was not the last thing that I would ever do. I knew that there were other things. I didn’t know if I would compete in pageantry again, but I knew that I still have goals for the future. And so that wasn’t the peak, so to say. 16. Who is you favorite pageant titleholder past or present? My favorite is Gretchen Carlson, Miss America 1989. She was actually Miss America the year that I was born. I guess I just relate to her most because she is in the industry that I eventually want to end up in (she’s a FOX commentator). And so I respect that she took the Miss America title and then ran with it and then really used the program the way it was intended to be used – as a way to kick start yourself into your career. 17. What do you admire about the current Miss America? The current Miss America is Nina Davuluri. I admire the fact that she is proud to be an Indian American and I relate to that because I’m a Romanian American. I love that she gets to do events that help out her community but also people from her own personal ethnic background. That’s the thing that I respect the most about her. After she had won, there was a lot of silly backlash asking, ‘How could Miss America be Indian?’ And I think that she took the criticism really well – it wouldn’t even be criticism – she took the hate really well. She is Miss America and she won fair and square. She’s a perfect representation of what this country is about. America is such a diverse country. She’s a second generation American like I am so she represents America’s diversity and I respect that about her. 18. What are you currently working on? I aged out of the Miss America organization. You can’t be older than 25 to compete on Miss America. This year, the Miss America competition is on my birthday and I’ll be 25. It’s ok! It’s not mean to be. But I will continue competing in pageants. I’m actually Miss Kirkland USA 2014 right now in the Miss USA organization. It’s a different organization so I wasn’t crowned. I went through an interview process, but I’m eligible to compete at State now. 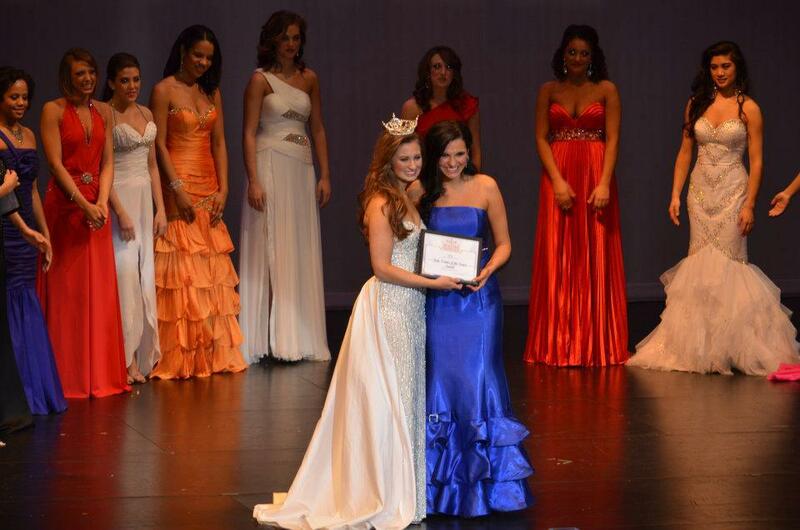 In Miss Washington through the Miss American organization, you have to win a local title to compete at State. But in Washington for the Miss USA pageant, you just go through an interview process and then you’re selected to represent your region or your city. The State competition for Miss Washington USA is in October so I’ve begun preparing for that. 19. What would you change about yourself or your life if you could? You always want to change something. I mean there are physical things I would change, but they’re silly. It would mean me being nitpicky about the features I’ve been given. It’s silly for me to even say those things. But I wish at times that I could be more patient. I wish at times that I could be less critical of myself and of others. 20. You love country music and swing dancing. Do you see yourself moving to Texas some day? I don’t think that I would ever move to Texas. I love Seattle so much. I can’t see myself leaving Seattle unless it was to go to New York. I’d go to New York. The winner of Miss USA ends up living in New York in the Trump Towers. And I’ve always had a fascination with New York. 21. What advice do you have for people working toward their dream? To answer your question, the advice I would offer is this: You have that dream and desire for a reason. Be confident in that desire. Be confident in the fact that you have those feelings. Put yourself out there. You’ll regret not doing it, but I don’t think that you’ll ever regret doing something that you wanted to do. f you don’t already have the pleasure of knowing this playful, enchanting, and genuine young lady, then I am honored to introduce you to Delia Lubanovici! You could find this sweetheart cheerily rollerblading along the breathtaking pier of Seattle, Washington while listening to her favorite country tunes (her favorite artist is Kacey Musgraves, by the way) or strolling through a soggy Disneyland with a couple of her girlfriends, wearing her red polka dot poncho and Minnie Mouse ears. But if you haven’t, then maybe you’ve watched a YouTube clip of Delia pacing forward on stage, overcome by emotion, as she accepted the crown and title of Miss Seattle 2013. In any event, if there is something you should know about Delia, she’s a visionary actively pursuing her dream of working in the entertainment industry. A business entrepreneur since 2012, the now 24-year-old owns and operates a European goods shop with her brother and partner, Jon. While she may have been crowned Miss Seattle 2013, the road to being a pageant queen was not always straight and smooth for Delia. She was introduced to pageantry through her older sister’s friend, Jennifer, and competed in her first pageant at age 15. On a whim, the rookie borrowed a dress from Jennifer and excitedly entered the Miss Washington Teen USA competition. She didn’t place that year, but returned the following year, still without desirable results. Even though she didn’t place high in the beginning of her pageant career, she enjoyed the opportunity to meet other girls from all over Washington State with similar goals and interests; and pageantry naturally suited her appreciation for fashion and dress up. What began as the perfect hobby for her bouncy personality quickly advanced into a serious endeavor once she began competing in the Miss America organization. 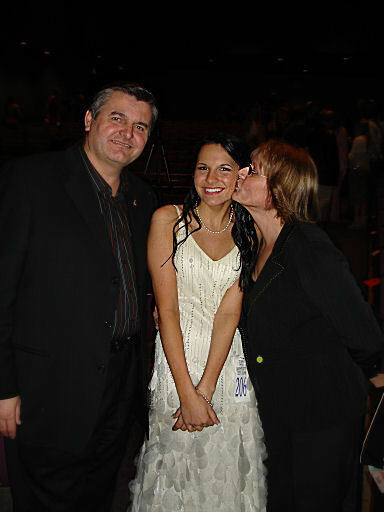 Mr. and Mrs. Lubanovici paid top dollar for front row seats to watch their daughter compete at her first pageant, Miss Clark County Teen USA, 2005. But her involvement in pageants raised eyebrows in the conservative Christian community she grew up in. Delia wasn’t prepared for the criticism she received as her parents and family were very supportive of her ambitions from the start. Instead of brushing the negative feedback under the rug, Delia kindly informed the naysayers about the organizations she’s grown to appreciate. “The Miss America program, for example, is a scholarship program,” she says. “Each year, they give over 45 million dollars in scholarships, making it the largest provider for scholarships for women in the world.” While some students earn grants though sports programs or through academic achievements, this became Delia’s approach to earning scholarships for her education at Northwest University. Erin Brady is the current Miss USA. This year’s Miss America, Nina Davuluri. Wholesome eating habits and cross-fit training were key elements to Delia’s overall physical health and fitness. “I never thought that I could actually win because I didn’t take my health seriously. I realized that food is meant to nourish our bodies. It is not meant to be a reward or something to indulge in to an extreme,” she explains. In 2012, Delia competed for the Miss Seattle title (a local preliminary of the Miss America organization), but didn’t place. Instead, she was elected by the Miss Seattle Board to receive their prestigious “Four Points on the Crown” Award, a scholarship reward that honors style, scholarship, service, and success. Other memorable awards Delia has received in past competitions include Miss Congeniality (three times) and top scores for evening gown and talent. Delia receives her “Four Points on the Crown” award at the Miss Seattle 2012 pageant. Delia’s strong desire to win forced her to persevere beyond her failures, learn from her disappointments, and strengthen her talents and abilities. She returned to Miss Seattle 2013 focused, confident and determined to win. Many pageant spectators may not realize the amount of work that some candidates put into their pursuits. Delia spent hours upon hours daily studying the Miss America program and its history. She researched past contestants and their interviews in preparation for the mandatory ten-minute interview with the judges. She read the newspaper on dozens of news outlets to educate herself on current events, shed twenty pounds and carefully planned her wardrobe. She was ready to answer any question at any given time. She was more than prepared for this competition and felt that she finally had a chance at winning the crown. Delia’s diligence and intense preparation just goes to show that modern day pageants are no longer superficial, but dig deeper to discover talented aspiring pageant queens who possess valuable critical thinking skills. The ten minute interview is a significant part of competition and occurs the day prior to on-stage competition. During this interview, candidates present their resume (i.e. educational background, platform, scholastic/career ambition, talent, etc.) and their platform statement (link). Delia’s personal platform consists of helping women build thriving careers and prosper in the mainstream workplace through programs such as Dress for Success. Delia celebrates her victory with family and friends. About a dozen of Delia’s close friends and family were present at this monumental competition, supporting their dear Delia. “One of the most supportive people was my oldest sister, Lia. She’s been to every single pageant and she gets emotionally invested. 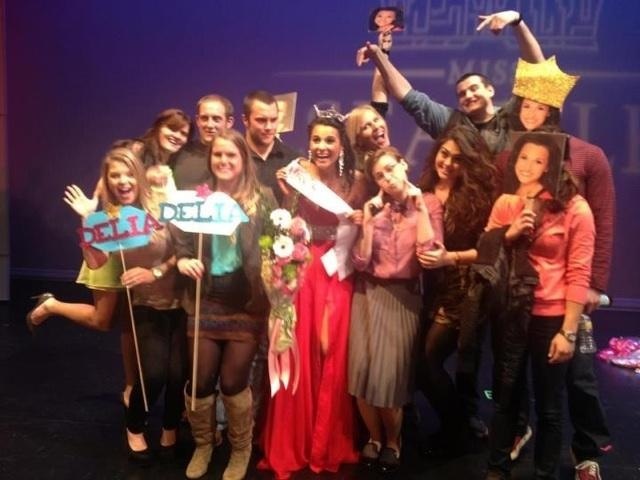 It makes me so happy to see her so involved and she loves that I love competing in pageants,” Delia says with a smile. Once crowning came, the 4th runner up was called, then the 3rd, followed by the 2nd runner up. The 1st runner up was named and then finally, the announcement sounded over the speakers across the auditorium: ‘Your new Miss Seattle for 2013 is … DELIA LUBANOVICI!’ Screams and cheers erupted from all around the auditorium. The new Miss Seattle 2013 announced! The crowning of Miss Seattle 2013. As she walked forward with tears rolling down her cheeks to receive her prized crown, she realized for the first time that hard work really brings results. Miss Seattle 2014’s contestants surround Delia Lubanovici, Miss Seattle 2013. Since crowning her successor late last year and saying farewell to her crown, Delia was invited to host “The Delio,” a web series via TDZdaily.com, where she spontaneously discusses any subject that falls under the entertainment umbrella. She mentors aspiring pageant contestants while continuing to operate a European imports store she opened with her brother and partner in 2012. 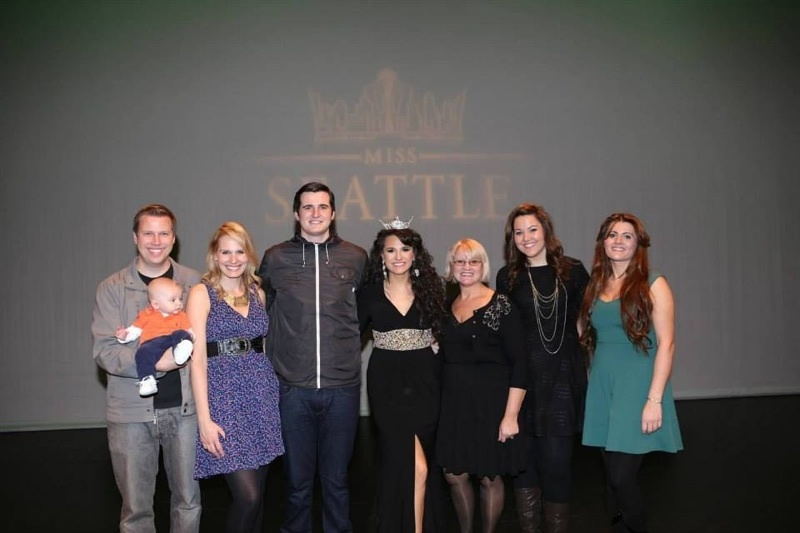 Delia’s farewell to her Miss Seattle 2013 title with her family. (From L to R: Brother in law, Greg and nephew; sister Gina, brother and business partner Jon, Delia, mother Mona, sister Roxy, and sister Lia. Delia’s father was on an international business trip and not pictured). Delia knows that bigger and better things are ahead for her and doesn’t plan on slowing down any time soon. She’s recently received the Miss Kirkland USA 2014 title through the Miss USA Organization and is currently preparing to compete for Miss Washington USA in October. She intends to follow in the footsteps of her two role models, Gretchen Carlson – Miss America 1989 and Rachel Smith – Miss USA 2007, who both took their coveted titles and used them to kick start their careers in television broadcasting. ~ UPDATE! Interview questions not included in this post are now available in an ALL NEW! Q & A with Delia. CLICK HERE!